Alons TV is testing in DVB-S2 Clear on 12188.00MHz, pol.H SR:27500 FEC:3/4 SID:5810 PID:1010/. Alons TV (undefined) broadcasts in DVB-S2 Clear on 11564.49MHz, pol.H SR:27500 FEC:3/4 SID:6205 PID:6217/6218 Arabic. New frequency for Alons TV: 11096.00MHz, pol.H (DVB-S SR:27500 FEC:5/6 SID:40 PID:832/1088 Arabic- Clear). 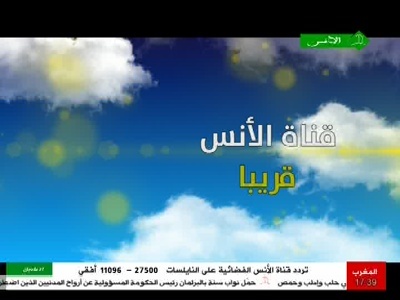 New SID for Alons TV on 12562.00MHz, pol.H FEC:2/3 SR:27500: SID:7205 ( PID:7105/7205 Arabic - Clear). New frequency for Alons TV: 12562.00MHz, pol.H (DVB-S2 SR:27500 FEC:2/3 SID:7105 PID:7105/7205 Arabic- Clear). A new channel has started in DVB-S Clear: Alons TV (undefined) on 11096.00MHz, pol.H SR:27500 FEC:5/6 SID:20 PID:800/1056 Arabic.